This example, which is a continuation of Example 4.14, demonstrates various methods for binning a histogram. This example also illustrates how to save bin percentages in an OUTHISTOGRAM= data set. The ODS SELECT statement restricts the output to the “HistogramBins” table and the “MyHist” histogram; see the section ODS Table Names. The ENDPOINTS= option specifies the endpoints for the histogram bins. By default, if the ENDPOINTS= option is not specified, the automatic binning algorithm computes values for the midpoints of the bins. The MIDPERCENTS option requests a table of the midpoints of each histogram bin and the percent of the observations that fall in each bin. This table is displayed in Output 4.18.1; the histogram is displayed in Output 4.18.2. The NAME= option specifies a name for the histogram that can be used in the ODS SELECT statement. The MIDPOINTS= option specifies the bins for the histogram by specifying the midpoints of the bins instead of specifying the endpoints. 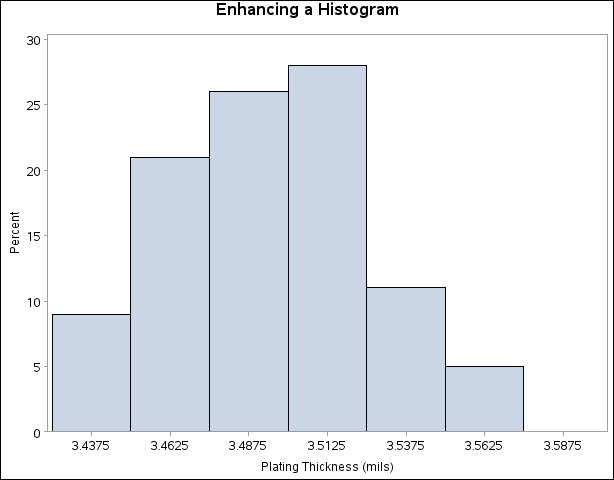 Note that the histogram displays midpoints instead of endpoints. The RTINCLUDE option requests that the right endpoint of each bin be included in the histogram interval instead of the default, which is to include the left endpoint in the interval. This changes the histogram slightly from Output 4.18.2. Six observations have a thickness equal to an endpoint of an interval. For instance, there is one observation with a thickness of 3.45 mils. In Output 4.18.3, this observation is included in the bin from 3.425 to 3.45. The OUTHISTOGRAM= option produces an output data set named OutMdpts, displayed in Output 4.18.4. 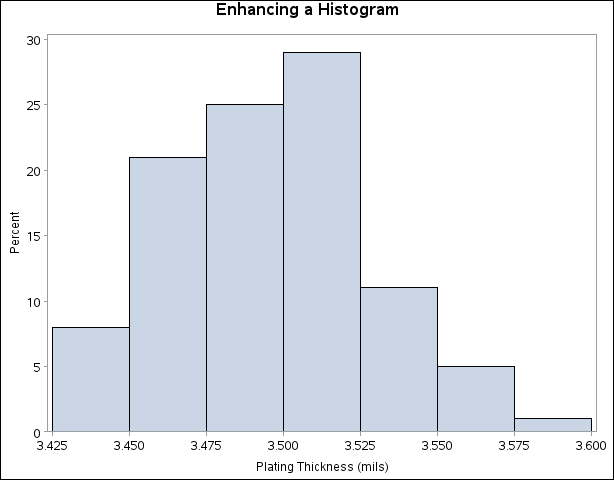 This data set provides information about the bins of the histogram. For more information, see the section OUTHISTOGRAM= Output Data Set. A sample program for this example, uniex08.sas, is available in the SAS Sample Library for Base SAS software.